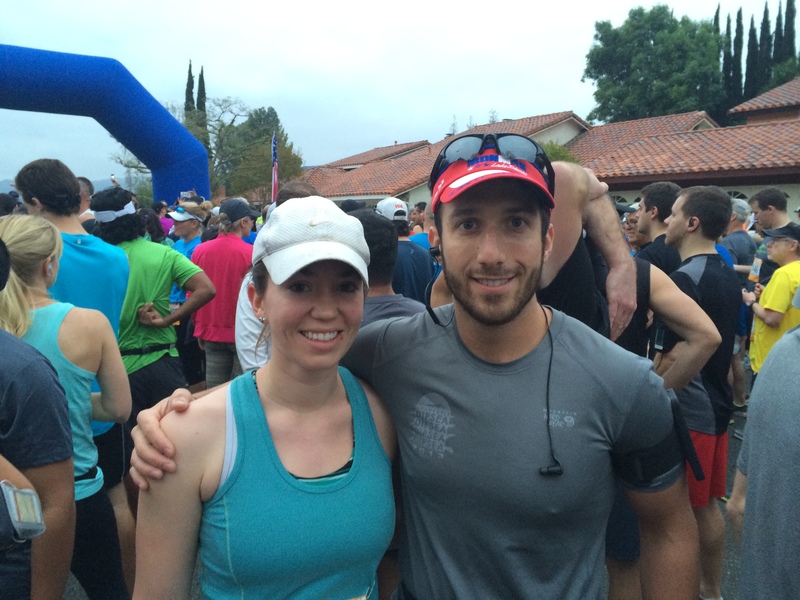 Jesse and I will be recounting last Saturday’s Chesbro Half Marathon at the Great Race of Agoura in two separate recaps because our experiences were so vastly different. Although we both achieved our goals of PRing, I had a pleasant race experience while Jesse struggled with the ramifications of traveling for work in the days leading up to the race. After a delicious dinner of Sharky’s and Yogurtland, Jesse and I passed out early, despite being super excited about our vacation. We woke up at 5am and parked in a grocery store parking lot after nabbing breakfast at Starbucks (oatmeal for me, bagel for him). We made it to the start line with maybe two minutes to spare after a porta potty stop. After a couple of mostly uphill miles on the paved suburban streets, the race really began to start at the Cheeseboro Canyon trail head. Eschewing my wonky Garmin for my Strava strapped on my arm, I had no idea what my pace was. When I reached the water station at mile 6, I realized I had been running about a 10 min/mile pace, which was on track for my PR. Although the first eight miles were entirely uphill, the whole course was runnable (save for the last quarter mile to the top of the hill at mile eight), making it the perfect race for runners looking to get into trail running. I felt great during these eight hilly miles. My legs felt good (due in part to foam rolling and stretching the night before) and my heart rate never spiked uncontrollably. And a big triumph for me: I didn’t have to stop to use the bathroom once during the race (which was good, because there was only one bathroom along the way). After reaching the top of the hill, I let loose and ran as hard as I could down the canyon. 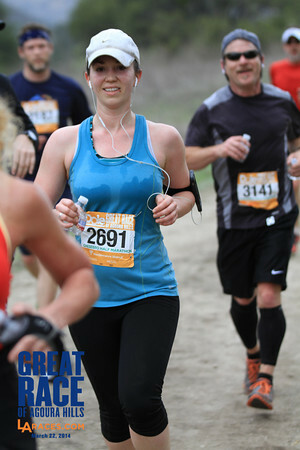 This part of the race was very Miwok-esque, and I was so excited to finally be running downhill. I started to bonk a little bit, but I was grateful to grab a little bit of gu at the aid station at mile 10.5. The last few miles were rough; I just kept telling myself to keep going. Although the miles to the finish were mostly downhill, the pavement felt terrible and the monotonous city streets were boring after the gorgeous SoCal canyon the course led us through. I started limping decently dramatically, but trudged forward. I crossed the finish line in 2:15, a new trail half marathon PR for me. We’ll definitely be back to run this great race! Sounds like an awesome run. I’ve become such a trail running snob after living in Marin for a year-ish. It’ hard to run pavement & monotonous city streets after experiencing that. Hopefully one day I’ll get used to it or get that job I’ve been after to bring me back to SF 🙂 How’s the recovery after those hills? Marin will definitely turn you into a trail running snob. 🙂 Recovery has been surprisingly good. Spun out our legs on the bike the day after and very little soreness! Well done on a great run! Way to fight through it! Congrats on the PR! Way to go on the PR. Always a great feeling!!! Awesome time for a trail, nice job! Good job! Sounds tough with all that uphill distance. Congrats on the PR! You really need to get me out on the trails! Thank you! And yes, I’d love to go trail running with you!